Micromax has officially launched its new smartphone Canvas 4 in India, the latest flagship mobile from Canvas series. 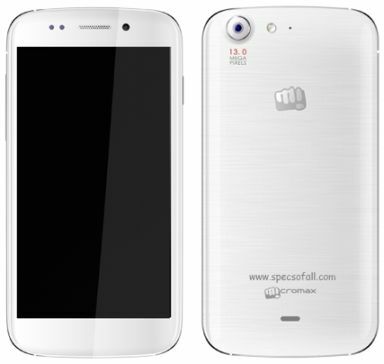 Micromax already started prebooking for this phone from June 28, 2013 for the price of Rs.5000. Canvas 4 features a 5-inch HD IPS display with corning gorilla glass protection and the resolution of 1280x780 pixels. It runs on Anroid 4.2.1 Jelly Bean operating system and powered by a 1.2 GHz Quad-core processor with 1GB of RAM. Micromax Canvas 4 is also a dual Sim support with dual standby phone and it has 16 GB of internal memory and the external can be expanded up to 32 GB with microSD cards. The phone features a 13 MP rear camera with LED flash and 1080p video recording features. It has also a 5 MP front facing camera for video calls. Micromax Canvas 4 comes with so many additional features such as blow to unlock, video pinning, smart pause, vertical panorama shot, multiple face detection, Anti-shake and more. Video pinning lets you watch videos in a pop up window while you are in another work. Good to see continuously writing articles, but we expect articles on blogging tips, seo etc.